This building opened in 1911 as a free public library, thanks to a £1,500 gift from one of the richest men in America. Today it houses the Radnorshire Museum, whose collections include numerous objects relating to the First World War. The library was one of many in Wales built with funds from the philanthropist Andrew Carnegie. Born in Scotland in 1835, he emigrated to the USA and amassed great wealth through various industrial ventures. He gave much of his money to good causes including libraries where working people had, for the first time, free access to books and other documents. Initially Llandrindod’s library housed a modest display of archaeological material from the nearby Roman fort Castell Collen. 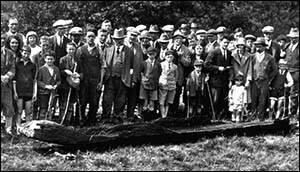 The discovery of a medieval log boat near Castell Collen in 1929 inspired the founding of the Llandrindod Wells Museum and the Radnorshire Society. The library’s new Museum Room opened in 1930. The log boat, thought to have been a punt, remains on display here. It was discovered when river water was unusually low during a drought. It was coated in wax preservative at the National Museum of Wales in Cardiff before returning to the new museum. Tree-ring dating in 2002 revealed that the timber was felled between 1198 and 1228. The photo, couresty of the Radnorshire Museum, shows the boat and onlookers on site in 1929. The Radnorshire Society, also formed in 1930, continues its work to this day. It donated many of the museum’s exhibits. The museum expanded throughout the building in 1971, when the library relocated to a former hotel. It achieved County Museum status with a major modernisation in 1993, when it received its current name. The museum’s collection covers archaeology, geology, palaeontology, fine art and social history, telling the county's story from prehistoric times onwards. Its exhibits include a carved stone sheela-na-gig (a pre-Norman fertility symbol) discovered during renovation at the Old Parish Church. It has a permanent display about the Victorian diarist Francis Kilvert. Inside the museum you can see the First World War "dog tag" (metal identity label) of David Richard Rogers who died, aged 22, in 1918 in the Middle East. His parents lived at Llanyre, near Llandrindod. The museum also has a crucifix taken home by a British soldier after he found it in the ruins of a French church. The collection includes letters and postcards sent or received by local people during the war, along with diaries. Other documents relate to the Royal Army Medical Corps, which had thousands of men billeted in Llandrindod for training. These include RAMC unit magazines which record the humour of the troops and illustrate the relationship between the town and RAMC.